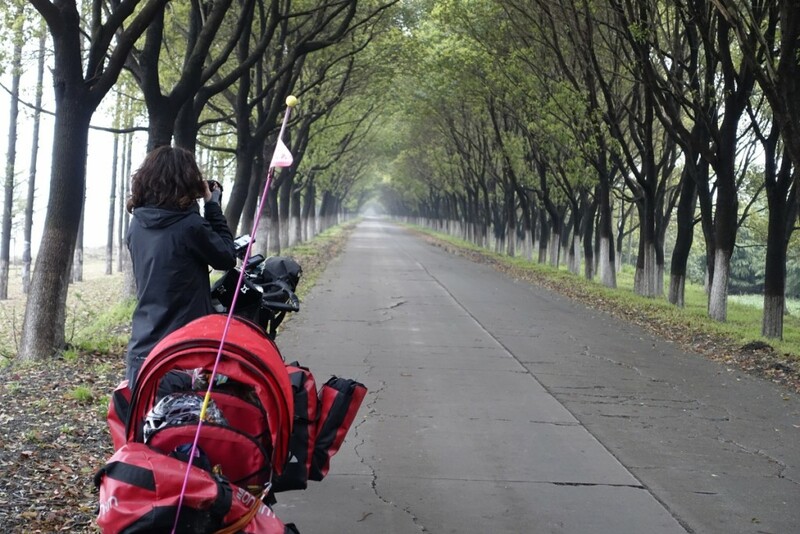 Ready to start the most epic search for Easter eggs ever, that would stretch for 82 km until our next station – the ancient canal town of Xitang. Volker is the navigator, checking now and then the route on his satellite Easter egg map, which would lead us to the places where the Chinese bunny hid its chocolate treasures. Sarah and Nora are the trackers. The first stop, however, was not foreseen. It was merely a hundred or so meters around the corner, in an old street where the local taxi drivers were just meeting for lunch. With a screw on the front luggage tray being loosened, one of the bags was hanging and about to fall. We managed to squeeze our length among the blue taxis, and in ten minutes the problem was fixed. We just started again along the street lined with plane trees, when another screeching coming this time from the back called for another unplanned stop. This time it was the tire rubbing against the mud shield. The third stop was also not on the map – we needed straps for a bag that Volker attached as an afterthought at the very rear of the trailer and which was about to drop down. But then we were rolling for real. While we celebrate Easter, for the Chinese this Sunday is the Qingming jie, the Festival of Pure Brightness, which falls on the 1st day of the 5th solar term (4th or 5th April). 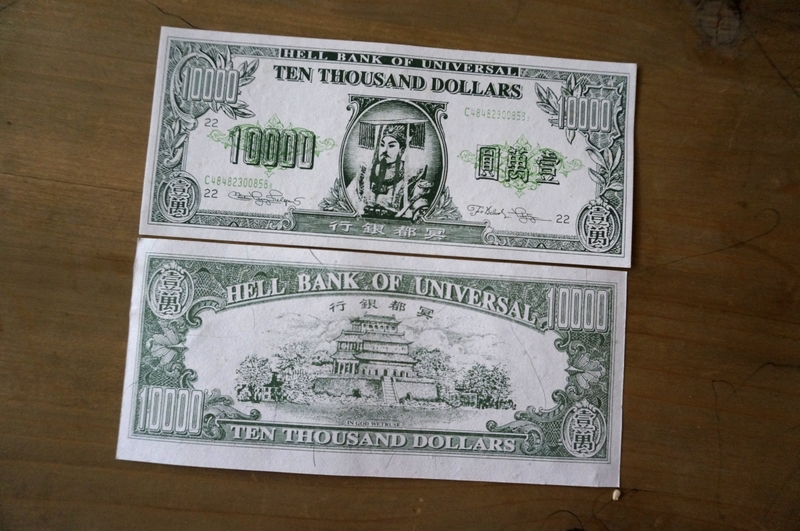 On this day, which is also known as “Tomb-sweeping day”, the Chinese go to the graves of their ancestors to commemorate them, make offerings of incense, tea, flowers, burn prints or paper models of everything the soul may need in the otherworld – clothing, cars, houses, mobile phones, golden ingots or, for the more modern souls, “hell-dollars”. The egg map determined the first location at the eleventh kilometre in direction south-west. Under the curious looks of the few locals, gathered at a small shop, Sarah and Nora diligently inspected ground under the bushes lining the street, quickly filling their bags with the bunny’s bounties of chocolates. And further we rolled – past research institutes, TV station, through a street with carpenters, through an area of wholesalers and markets, where the traffic got somewhat chaotic. After the scrap-iron collectors suddenly the first affluent suburban compound emerged, fenced off and hidden behind decorative trees. From time to time a car in the adjutant lane aligned with us, and kept our speed for a while with the driver diligently recording the unseen sight on the mobile phone to prove that he is not making up stories. Around the eighteenth kilometre I understood the reason why biking pants were invented. And to think that I have two pairs of them, – all left at home after Volker persuaded me that none of the professional long-distance cyclists ever used padded pants. Since I’ve been biking daily 4 km, somehow I thought I could qualify if not for long-, then at least for short distance professional status. At a crossroad we have to stop – the street which we were supposed to take according to our map is totally jammed by cars. 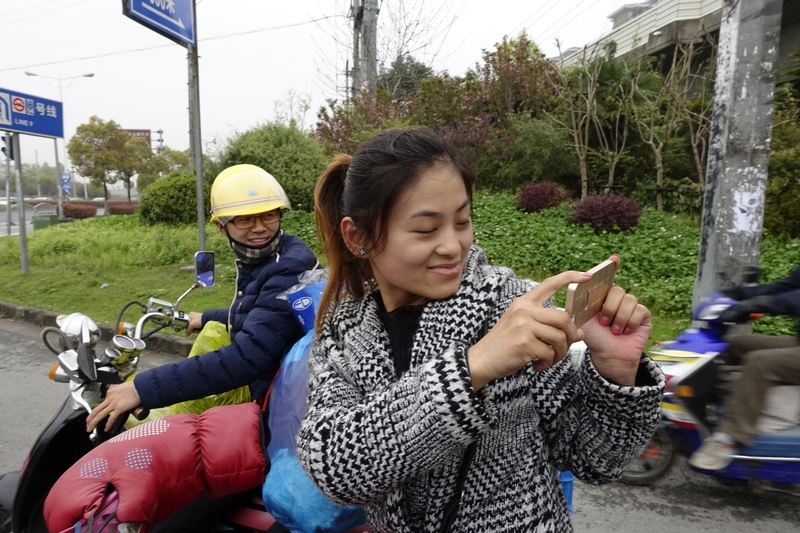 Quickly a crowd of motorbikers gathers, mobile phones in hands, and we are bombarded with exclamations, smiles and questions: Are the girls twins, aren’t they cold, from where are we biking…. The red light has long turned to green, but nobody cares. The cars trying to pass by go on honking, till the drivers spot us, and also stop. Luckily, Volker quickly finds an alternative route and we leave before a major traffic accident could happen. The new street brings us, nevertheless, to the next site of egg treasures. And further we roll, through a huge area with islands of construction sites, villa compounds, a golf course, a cemetery with huge (and empty) parking lot, an amusement park, a factory or two. Yellow fields of blooming rapeseed gradually took over, but it lasted a while till I realised that the big two or three storied houses and the solar powered street lamps among which we were passing were actually villages. After fifty kilometres the map showed no more egg treasures. Apparently, the Chinese bunny was much slower than us. Luckily, at that time we reached a canal and turned along its bank. 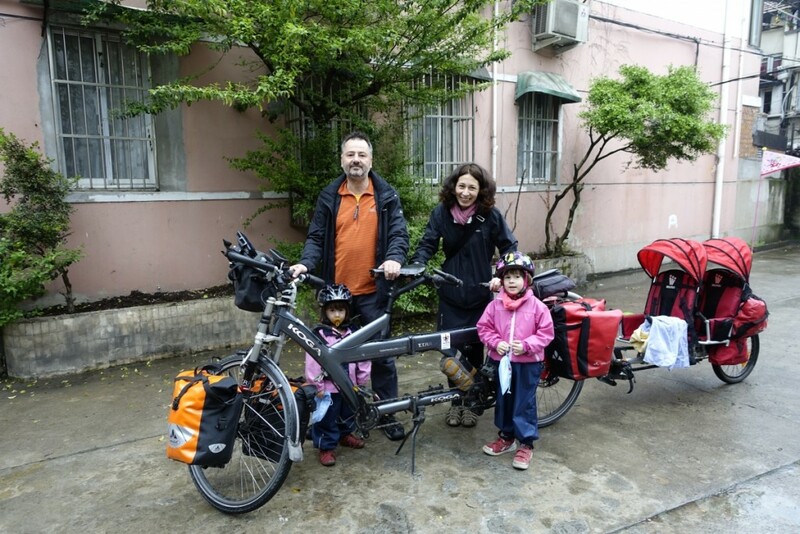 This was a part of the Grand Canal, completed in the seventh century, that connects the Yangzi and the Yellow Rivers, and along different parts of which we will bike the next week. As Sarah and Nora started to lose patience and to whimper “Wann sind wir endlich da?”, our tandem initiated a wild race with the barges on the canal. Will we overtake the green one? Yes, yes, pedal more, yes, we are catching up, we get ahead… We roll through a tunnel of trees, which in the early evening haze looks like an enchanted forest. 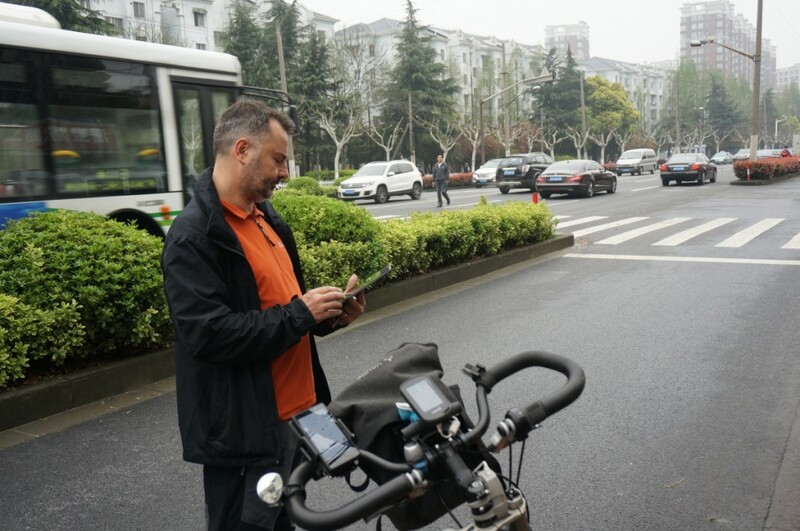 And when we hit the bigger street again, we have a dilemma: A big traffic sign states that Xitang is to the right, direction north, however, Volker’s navigation shows that we have to turn exactly to the opposite direction – to south. His intuition luckily chooses south. And then it starts to drizzle…and to rain. Twelve hundred years ago a famous Tang poet wrote about a traveller on the road, caught in incessant rain on the day of Pure Brightness, how could I have hoped that with us it might be different? Finally we reach Xitang, and are caught in a whirlpool of tuck-tucks, tour busses, cars, groups of Chinese tourists, just coming out of the gate of the old town. I remembered Xitang from my first visit eleven years ago as a dreamy little town, crisscrossed by channels and bridges, with rows of ancient houses rising from the water. I remembered the strolls along the ancient lanes among the carved window latticework, meeting just few locals on the way, hearing the voices of the old men from within the neighbourhood teahouse. But now we found ourselves on a broad highway jammed with cars and busses – and for the first time during the day out of a biking lane. In the rain and darkness, caught among cars which try to squeeze through every free gap, even the kids stopped whimpering, and I almost became hysterical. Our saviours came in the form of traffic policemen, who immediately stopped the traffic, gave us directions and helped us negotiate our way through the crossroad. As we were about to get lost again, another group of policemen loomed ahead of us. They gathered around us in amazement, which reached its high point when Volker opened his notebook in the rain to show them the address we were looking for (does this thing work without electricity?). And finally we make it to our hotel. The bed frames are painted with pink flowers, just to the girls’ liking, and lo and behold – the Chinese bunny has made it ahead of us after all and hidden the last Easter eggs in the drawers and under the pillows.